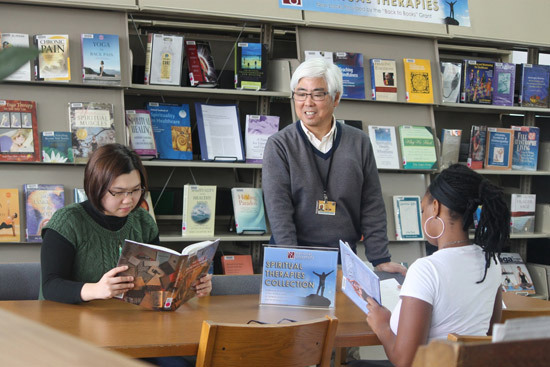 The Learning Resource Center offers over 15,000 book titles; 140 current print journal subscriptions; over 100,000 electronic journals, ebooks and streaming videos; and 32 bibliographic databases in a collection supporting NUHS programs in chiropractic, naturopathy, homeopathy, acupuncture, oriental medicine, massage therapy, and biological sciences. Monday - Thursday: 7:30 a.m. - 11:00 p.m.
Friday: 7:30 a.m.- 6:00 p.m.
Saturday & Sunday: 11:00 a.m. - 9:00 p.m. Note: Hours may vary. Call to verify. The LRC is building C on the Lombard campus. Note: The Special Collections material is housed off-site. Please allow a week from the time of your request to the arrival of material to the library. You will be notified when it is available. You can call the circulation desk with your request.